produces all types of Cross Recess Punches as per DIN, IFI, ISI & JIS Standards to suit any of your production needs. Standard Punches available for production applications. "Super Punch" for high volume production applications for Alloy & Stainless Steel. Punches also manufactured to customers specifications. manufactures wide range of Struck Slot & Conventional Punches as per DIN, IFI, ISI, AISI, JIS and British Standards. Most of the Standard Punches are in ready stock. to meet the immediate requirement of Customers. Non Standard Punches as per Customers specifications are made against order. 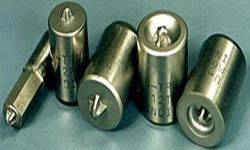 manufactures a wide range of Standard Trim Dies and wafers with special process. Exceptional surface finishes for reduced friction resulting in extended tool life. Range of steels available to customers specifactions Consistencies of size & finish. manufactures Socket Punches as per DIN Std.912, 'K' & 'L' series. Hexagon Recess Punch for Counter Shank & Round head. Socket Punches manufactured as per all standard and as per Customer's Specifications. manufactures a wide range of Special Tooling. All special made as per customers Specifications. We provide Assistance for Design & Development of your products.